New Delhi: The Ganga and five other rivers are still flowing above danger mark in many parts of Bihar, triggering a flood-like situation in the districts situated along the banks of the river while in Uttar Pradesh water level of major rivers has crossed the red level at several places in the state. 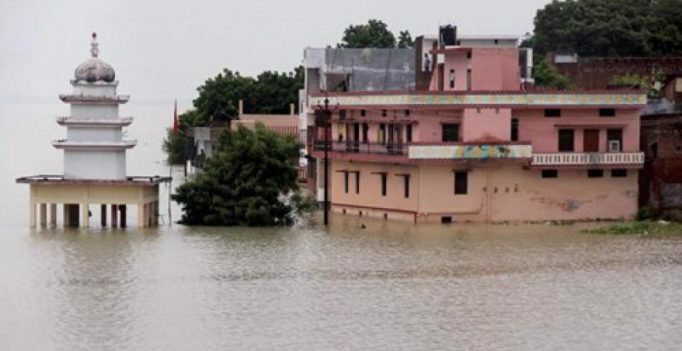 The districts witnessing flood-like situation in Bihar included – Patna, Vaishali, Buxar, Bhojpur, Saran, Begusarai, Samastipur, Lakhisarai, Khagaria, Munger, Bhagalpur and Katihar – a Disaster Management Department statement said. Delhi on Monday experienced a sultry day with mercury settling at 36 degrees Celsius, two notches above normal for this time of the season. Ganga and five other rivers were flowing above danger mark in Patna, Bhagalpur, Khagaria, Katihar, Siwan, Bhojpur and Buxar districts of Bihar. Ganga was flowing above danger mark at six places in Digha ghat, Gandhi Ghat, Hathidah in Patna, Bhagalpur and Kahalgaon in Bhagalpur district, and in certain points of Munger district and Buxar district, it said. Ganga, Yamuna, Sharda and Ken are flowing above the danger mark in Uttar Pradesh. According to Centre Water Commission (CWC), Ganga is flowing above the danger mark at Fafamau and Chatnag in Allahabad, Mirzapur, Varanasi, Ghazipur and Ballia while Yamuna is flowing above red mark at Chillaghat (Banda), Hamirpur and Naini (Allahabad). Ken river is flowing above the danger mark at Banda while Sharda has crossed the danger mark at Palliakalan (Kheri). Heavy rainfall has been recorded at isolated areas in Udaipur and Jodhpur divisions in Rajasthan since Sunday. Pipalkhunt in Pratapgarh recorded a maximum of 12 cm of rainfall while Jhadol in Udaipur recorded 11 cm. Many other areas received below 10 cm rains. Heavy rains are expected to lash the state in the next 24 hours, the Met department has predicted. The National Disaster Response Force has fanned out 56 rescue and relief teams to help people hit by heavy rains in various states and tasked two Deputy Inspector General-rank officers in Bihar and UP with monitoring the situation. “So far, the NDRF teams have evacuated more than 26,400 people from various flood-prone areas in the country this monsoon season. Besides the rescue work, these teams have provided medical care to the more than 9,100 people in these states,” the force said. Delhi recorded a maximum temperature of 36 degrees Celsius and the humidity levels oscillated between 92 and 76 per cent. The weatherman has predicted generally cloudy sky for Tuesday and maximum and minimum temperatures are expected to hover around 36 and 25 degrees Celsius respectively.